Oh to be a fly on the wall of this bookshop. I just finished reading A Passion for Books compiled and edited by Harold Rabinowitz and Rob Kaplan. The book was a fun read. Really fun. It was full of crazy book collectors and crazy book collector stories. One of my favorites is where A.S.W. Rosenbach is sharing stories from his time around his uncle’s bookstore / publishing house: his Uncle Moses’ Shop on Commerce Street. Can you imagine a bookstore like this? 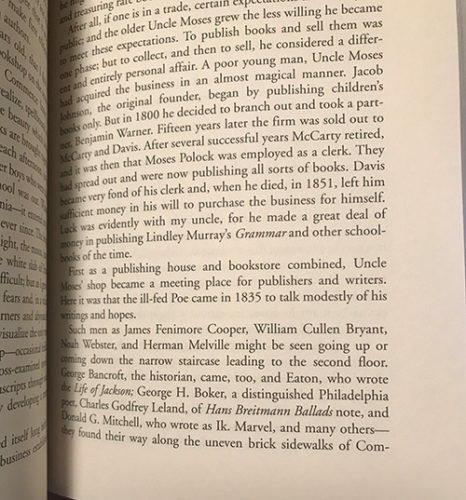 A bookstore where Edgar A. Poe, James Fenimore Cooper, WC Bryant, Webster, and Melville, all frequent and hang out? What a storied childhood! No wonder Rosenbach landed where he did in the pantheon of bookmen. There is one thing readers enjoy almost as much as reading and that is talking about books. And if the topic is rare books, then all the better. There’s something about the study of preservation and the hope of an amazing find at a used book store that stirs reader’s hearts at a deep level. This is why the Rare Book School exists. The folks at the Rare Book School readers’ and book collectors’ hearts all too well. I’m sure it’s part of the reason they have made 100+ lectures available for FREE online. Most are audio-only and play in your browser, but some link to YouTube videos where you can see the lecturer and artifacts. All of the sessions last around an hour. The oldest lecture is from 1973 and the Rare Book School just added another class session from August 3, 2016. Just click through and check out the lecture topics. It’s amazing how specialized the roster of speakers are. The topics are very very focused and toe the line of strictly academic every second. I happen to think this makes them all the more valuable and interesting. These are real lectures by practitioners and researchers in the fields of preservation, biography, collecting and antiquities. It’d be fun to hang around after one or two of these classes and see what everyone talks about. 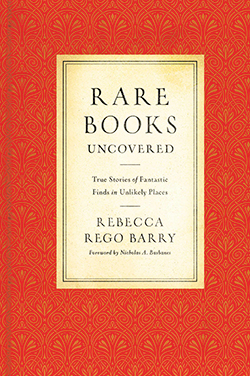 If this kind of thing strikes your fancy then I’d also recommend Rare Books Uncovered: True Stories of Fantastic Finds in Unlikely Places by Rebecca Barry. I just picked it up and am only a couple stories into, but it’s a fun collection of stories. They are all in the “that time a Hemingway 1st edition was found at a yard sale for $1” vein of wishful thinking. Dare to dream. ‘Books about books’ is my favorite category at the bookstore. It’s often a difficult section to find. Some shops place them in the ‘Collectibles & Antiques’ area. Others in the ‘Essays’ or ‘Reference’ sections. Some of the best book stores will gather all of the books about books under the heading of ‘Literary Non-Fiction’, which seems as appropriate, while the best shops do create a curated “Books About Books” section. I’ve often wondered why this isn’t the first section every book shop stocks. One can pretty much guarantee that, while not every browsing customer will agree on which hot political book to read or which classic work is the best, every potential customer is someone who appreciates books. Right? The folks at the LitHub have offered a five-book list The Best Books About Books. I’ve only read Dirda’s Browsings. But I like the sound of Tim Parks’ Where I’m Reading From, so it’s been added to my TBR list. In hopes that you too are a kindred bookish type, I’d like to offer five books that I think are at the top of the ‘books about books’ category. These are all books I’ve read and continually recommend to folks. On LibraryThing, I keep a running list of the books about books I’ve read and have-yet-to read. My list includes both fiction and non-fiction. Please let me know if you have read a good one that I’ve missed. So Many Books: Reading and Publishing in an Age of Abundance by Gabriel Zaid – This one is only 160 pages and it outlines perfectly many of the challenges that modern publishers and readers face in today’s book world. Ex Libris : Confessions of a Common Reader by Anne Fadiman – If there were to be one book on everyone’s books about books list I imagine this 162-page book honoring all that’s beautiful about words and books would be it. The Yellow-Lighted Bookshop: A Memoir, a History by Lewis Buzbee – I can’t quite put my finger on why this book rises so much higher than all the other ‘bookstore memoir’ titles out there, but Buzbee nails just about every feeling and thought I’ve had about bookshops. The Library at Night by Alberto Manguel – By far the heaviest and deepest book on my list, Manguel relates the philosophies, histories and importance of book collecting and reading like no one else. At Home with Books : How Booklovers Live with and Care for Their Libraries by Estelle Ellis – This is a big coffee table book full of the most gorgeous and inspiring images of home libraries running alongside great interviews with the people who own them. This past week saw a new world record was set for the most money paid for an American book. The winning $9,826,500 bid was placed, at Christie’s, by the Mount Vernon Ladies Association which won them George Washington’s personal copy of the Constitution and Bill of Rights printed in 1789. What makes this book so cool is that it has all of Washington’s notes and thoughts scribbled throughout. Pretty crazy to think about George holding this very book while circling passages as he (and the rest of the country) is trying to figure out just what all the President is allowed to do. Very very cool. The book is making its way back to Mount Vernon where it was until 1876, when it began its journey through private libraries and auction houses.